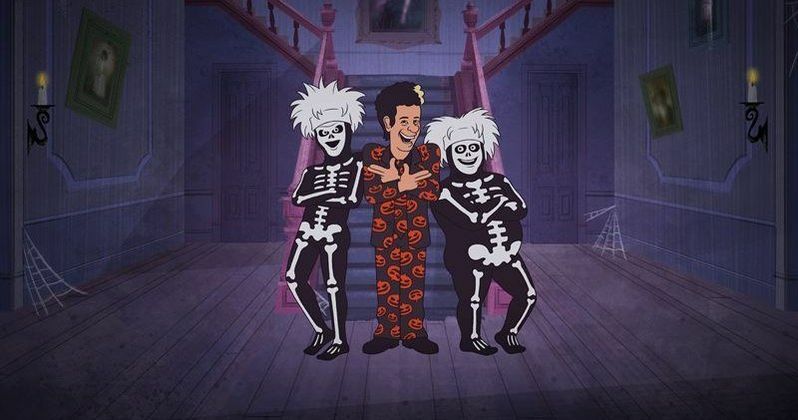 Saturday Night Live legend David S. Pumpkins is returning to NBC for a Halloween-themed animated half-hour special on Saturday, Oct. 28 at 11:30 p.m. ET/PT. Any questions? The David S. Pumpkins Halloween Special is based on the wildly successful "Haunted Elevator" sketch from the Oct. 22, 2016 SNL telecast that featured nine-time host Tom Hanks as mystery man David S. Pumpkins, on an elevator wearing a pumpkin suit and surrounded by two skeleton dancers, played by Mikey Day and Bobby Moynihan. Here's what George Cheeks, President, Business Operations and Late Night Programming, NBC Entertainment and Universal Television, had to say in his statement. "It's scary how quickly the original SNL sketch caught on, and we're thrilled that Tom Hanks is back to keep the fun going." The David S. Pumpkins Halloween Special will feature the voice of Hanks, who will also appear on camera at the beginning of the half-hour, as well as two-time Emmy Award-winning Game of Thrones star Peter Dinklage. Sketch creators Day, Moynihan and Streeter Seidell will have voiceover roles as well. Set in a small suburban town on All Hallows' Eve, the special centers on David Pumpkins and his skeleton sidekicks who show a young boy and his sister the true meaning of Halloween, answering none of their questions along the way. After the original appearance last October, there were a few more references to David S. Pumpkins throughout the season. During a failed sketch on the November 12 episode last season, host Dave Chappelle said that he thought his character in Jheri's Place would be "the next David S. Pumpkins," and in a promo for the following episode hosted by Kristen Wiig, Pumpkins' skeleton sidekicks were featured in an homage to the viral sensation as they did The Mannequin Challenge. In the Season 42 finale, hosted by Dwayne Johnson, where the actor also announced that Tom Hanks would be his running mate in the 2020 Presidential Election, David S. Pumpkins appeared as "David S. Pimpkins" in the music video parody "Rap Song." Tom Hanks was nominated for an Emmy for that episode, but he lost out to another SNL host that season, Dave Chappelle, while Melissa McCarthy also won an Emmy for her Sean Spicer impersonation and Alec Baldwin won for his Donald Trump impersonation. The David S. Pumpkins sketch was one of many highlights of an impressive season, which ultimately lead to the Saturday Night Live ratings reaching a six-year high in February. The hit series recently announced that Ryan Gosling (Blade Runner 2049) will host the SNL Season 43 premiere in just a few days on Saturday, September 30, with Gal Gadot (Wonder Woman) hosting the October 7 episode and Kumail Nanjiani (The Big Sick) hosting the October 14 episode. Bento Box Entertainment will provide the animation for the special. Mikey Day, Streeter Seidell & Bobby Moynihan will write and produce. Lorne Michaels will executive produce. The David S. Pumpkins Halloween Special is a production of Broadway Video in association with SNL Studios. Take a look at the first photo from this animated special, courtesy of NBC, and, in case you never saw the original sketch, or want to re-live it again, you can take a look at the original video below.